Holiday Moments is a pattern for two different holidays. You receive all three versions of the pattern in this delightful creation. 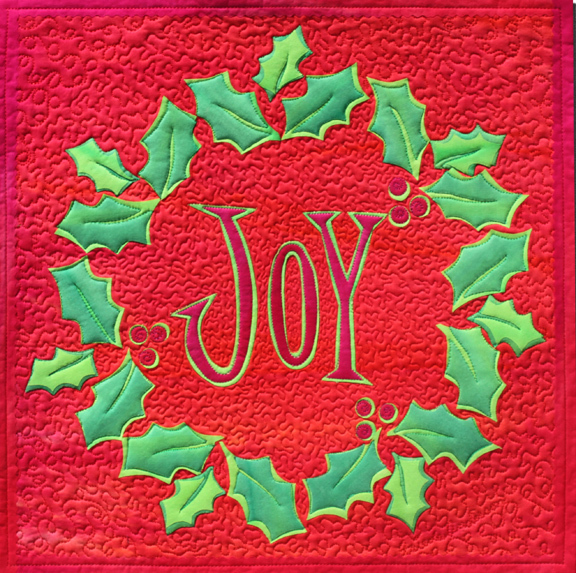 You have plenty of time to make JOY or PEACE before the holidays begin and it can be hanging on your wall or front door to welcome your guests into your home. Then after the holidays you can make LOVE and have it hanging for Valentine’s day. Holiday Moments is on SALE until the end of DECEMBER. Get your copy now and start the fun. I taught JOY at the IQF quilt show in HOUSTON, TX last week and everyone in class was able to get all the leaves and letters cut out and ready to fuse in place in just three hours. Several people got the top fused in place to take home and quilt and I’m sure will have hanging up in their home by December 1st, you can too! Don’t miss out on the SALE of this pattern. So sorry I missed you again this year at Quilt Festival. Did get to chat with Laura a few minutes and nought a skein of thread to quilt a fun applique quilt probably soon. Have a wonderful holiday season! I KNOW, so sorry as always to miss you, I know Laura enjoyed talking with you. It is just crazy at that show, Laura and I both teach and do the booth, so there is lot’s of running around. So happy you are well.